Peter Vesterbacka, the man behind Angry Birds, wants to change the world — again. Having developed the most popular game in the world, he is now shifting his attention to education. The Finnish maverick has more than one thing going for him. First, Finland was voted the best in the world for early childhood education. And second, he knows how to develop games that children really, really like to play. He has combined the two and is now eyeing a piece of the US$6.3 trillion global education market. Vesterbacka had worked at Rovio Entertainment Corp — a Finnish developer, publisher and distributor of video games headquartered in Espoo, Finland — and the Angry Birds brand for six years. But last summer, he grew restless. “I said that after we came out with the movie that made it to No 1 in 52 countries that it would be a good time for me to start looking at bigger things. But what could be bigger than Angry Birds with four billion downloads and the top movie in 52 countries? What could be bigger than a brand that is known by 93% of the Chinese population and pretty much everyone on the planet?” says Vesterbacka. There is only one thing that is significantly bigger, and that is education. “If you look at the global market for education, there are many figures being bandied about. But one of them, which I saw in a report, is US$6.3 trillion. That makes it the second biggest market after food,” he says. But for Vesterbacka, it is more than just being part of a really lucrative market. He compared the Finnish low-stress education system with those of some countries that also achieved excellent results and decided that what children around the world needed was a break. “If you look at our basic education, we are the only non-Asian country that is up there in all the reports, competing with the likes of Singapore, China, Japan and South Korea,” he says. But Finland achieves its results very differently. “We have very short schooldays and not a lot of homework, so children here kind of have a life outside school. I realised this big difference because I have friends in Singapore, China and all over Asia,” says Vesterbacka. Talking to his friends about what their children have to go through in school, he began to see the great differences in how children were taught and the amount of pressure exerted on them. For instance, his friend in Singapore told him what it was like when her daughter started school there. “Her daughter was told the 50 to 60 things she was not supposed to do and the few things that she was. And then of course, the schoolday started very early and ended very late. This was not just during the week but also on weekends because they needed extra tutoring so that they could compete with the other children,” says Vesterbacka. It was then that he realised how different the Finnish education system actually is. It achieves fantastic results and the children are actually happy. “I said that if we could make our system global and make it more effective, maybe we could reduce the market size to US$3 trillion. And then we modest Finnish people would be happy to capture just 10% of the global market, which is only US$300 billion — still slightly bigger than Angry Birds. So that is kind of what I have been up to,” says Vesterbacka. He has decided to focus on this mission for the next 20 years. He has been working on this project for two years now. “We brought together some of the people who made Angry Birds and teamed up with CERN (the European Organisation for Nuclear Research) — one of the world’s largest and most respected centres for scientific research,” he says. Vesterbacka called it Big Bang because that is where life, the universe and everything else is supposed to have started. The first game they worked on was all about particle physics. “When you play the game, you actually have a lot of fun, which is of course, important. But then, you also start learning particle physics without realising it,” he says. The company that developed and markets Big Bang Legends is Lightneer Inc. Vesterbacka is its “brand breaker and co-founder” while the advisory board includes the likes of British mathematician Marcus du Sautoy, CERN head of global outreach Rolf Landua and Games Workshop co-founder Ian Livingstone. The game has been around for a year and Vesterbacka says the learning results have been very good. “We made the whole periodic table into characters — all 118 elements. So what we are doing is like the Pokémon of particle physics. If you ask your children what their favourite Pokémon character is, they can tell you in two seconds — it is Pikachu, it is Squirrel. And they can tell you all kinds of interesting stats about their favourite Pokémon. Lightneer has tested the game in Finland, Singapore, Argentina, Slovakia and even Uganda. “We start by asking the children how many of them love games and 99% of them raise their hands. When we ask how many of them play it in class, only a few of them admit to doing so. And we say, ‘Yeah, you should play more games,’” says Vesterbacka. Then they ask the children how many of them love particle physics. “Maybe one or two 16-year-olds raise their hands. We give them all iPads and they play our game for 15 minutes. Then, we collect our iPads back and ask them whether they liked the game. A couple of weeks ago, a 12-year-old girl told us, ‘Best game ever’, which is of course, fantastic feedback when you make games. So, the game seems to be appreciated and the children typically tell us that they could keep playing for the whole lesson,” says Vesterbacka. Then comes the crucial question — whether they learnt anything while playing the game. “We all get the same feedback: ‘No, I didn’t learn anything.’ This is a big concern if, like us, you are making learning games,” he says. Vesterbacka is very excited now that the basic elements are attracting the same kind of fandom as Pokémon characters. “But now you are learning something that may be useful. So, when you get the periodic table in school, it is no longer intimidating. You know all these guys because you play the game,” he says. Lightneer is going to develop games for all subjects. “We started with particle physics, but we are going into quantum physics, then we will get into molecules with chemistry, biology, geography, languages. 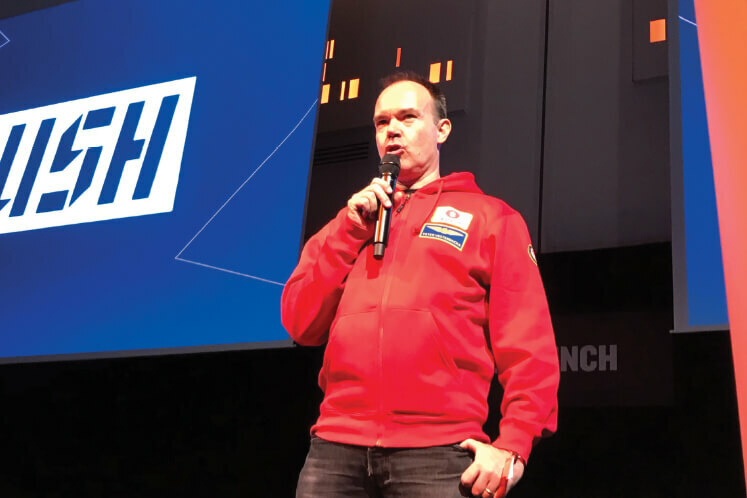 It will, of course, take many years and hopefully, we can grow the company,” says Vesterbacka. Vesterbacka envisages that Finland will do for education what it did for games. “We have the highest talent density when it comes to games. We have had a lot of success in education, where some would say we are pretty good, maybe even the best in the world. So now, we are bring these skills together and going after this market,” he says. Lightneer’s business model is simple. The game is free, but it will be interrupted by advertisements. “You can replace the ads and subscribe to 30-second particle physics lessons by famous scientists such as Marcus du Sautoy of Oxford University, a celebrity scientist. For 99 US cents a month, you can replace the ads with more educational content,” says Vesterbacka.